When starting any Adwords campaign it is important to have a good idea of the keywords that you want your adverts to appear for. This process usually starts with a brainstorm of the subject matter followed by further research using online tools. One key area that is often overlooked by agencies and advertisers alike, is misspellings. Due to the lack of competition, a misspelled variation of a generic keyphrase on exact match may well be cheaper than the original correctly spelt keyphrase. Adwords advises that these terms should be picked up by broad match but this method, in my opinion, is not cost effective. characters (EG. Compputers), missing characters (EG. Comuters), swapped characters (EG. Comupters) or character proximity errors (EG. Compyters). This seems fairly logical. 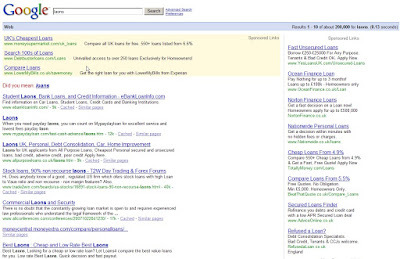 There are a number of advertisers bidding on the term that is regarded as one of the most desired terms in paid search. Yet, performing a search on the keyword "laons" brings very results. In this search, a different set of advertisers feature on the page. The bigger players with significant search marketing effort are clearly targeting the misspelled keyword, yet some of the smaller organisations who were bidding on "loans" do not feature on "laons". Similarly, there could be canny advertisers that cannot afford to bid on "loans" and so target misspellings instead. So why do a lot of advertisers not deem it necessary to bid on misspellings? One option could be that most search engines provide "Did you mean?" functionality using a database of previous queries and search activity to make suggestions on the users original search. Many consider that users would simply click on this link first, when this is not necessarily the case. 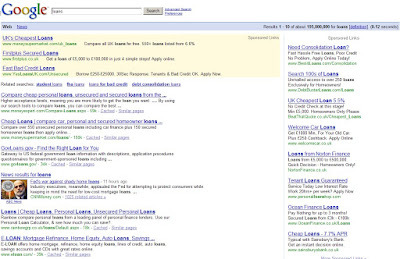 The screenshot above shows how the main paid search adverts appear above the Did you mean? option. We already know that the user may have a certain degree of lethargy as their original search was not correctly spelt. In this scenario, the majority of users click on the paid search adverts over the Did you mean? option. I can tell this by looking at the click-through-rate (CTR) of misspellings in our campaigns. It is also worth noting that misspellings also can be used in natural search as well, although this has not proven to be as effective. The first natural result on the search "loans" must have significant resource into attaining this position at considerable cost. I would anticipate that the first organic result on the keyword "laons" has invested less in attaining this position. The reason this is less effective, is due to the fact that the organic terms feature below the Did you mean? option in the SERP's. It must also be considered that in order to achieve first position, this advertiser has had to include the mispelled term on the page. it is not necessarily desireable from a brand perspective to have a page talking about "laons". Users want to get from their query to the most relevant result as soon as possible. This is why search engines still advertise the time it took to complete a search. Therefore, as an advertiser, it is fundamental to have all your bases covered; to consider that users are becoming increasingly demanding on their search experience and not necessarily willing to invest more time in detailing their query. They want the search engine to predict the results they require and as advertisers, we must respond accordingly. This post, written in order to demonstrate the power of adding misspellings to a search campaign, already features on the first page of Google for it's targeted and deliberately mispelled keyphrase "Online Marketign Manager".